I love burgers, looooooove them. My friends joke that no matter where we go, if there’s a burger on the menu i’ll order it. During my time in Japan i’ve sampled quite a few(with many more to try) and my personal favourite to date is Freshness Burger. Freshness Burger is a well established chain in Japan(189 stores according to Wikipedia!) their restaurants have a nice friendly feel with wooden flooring and furniture – making them look alot less fast food than Burger King or McDonalds. Ordering is an absolute breeze as all menu items have their name spelled in english as well as Katakana, if you aren’t comfortable trying to order verbally they also have placemats on the counter so you can literally point at the items you’d like – much like McDonalds in Japan do also. Find yourself a seat and your lovingly prepared meal gets brought across to you in a nice little basket with the Burger wrapped in paper so you don’t get all messy, it never hurts to try the terrifically chunky chips too. My personal fave is the Classic Burger with cheese, which consists of burger, red cheddar, massive slices of onion & tomato the size of the burger and salad. So good. 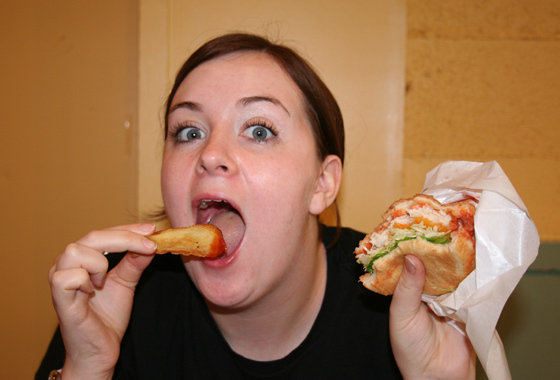 Emma prefers the plain or teriyaki chicken burgers. All burgers are made to order so whatever you get it’s fresh, piping hot and super good! I’ve added a google map with streetview below to the Kanda branch which is the one I personaly visited as it was near our hotel. I’ve found them all over the place though, from Ebisu to Osaka! On my next trip in December, Awajishima burger is a place i’m looking forward to trying… rumored to be one of the best burgers in Japan! Here’s a great video of one guys visit, looks awesome! To make up for the fact i’ve decided to cover a chain restaurant i’ve included my homemade burger recipe, please give it a try! Firstly add the mince, garlic, chillis, red onion and beaten egg into a large bowl. Add the tablespoon of ketchup and work all the ingredients together with your hands. Once it’s all nicely mixed add your basil in and work that in too. I’d recommend leaving them in a cool place for about 10-15 mins to let everything settle, and then cook on your device of choice! 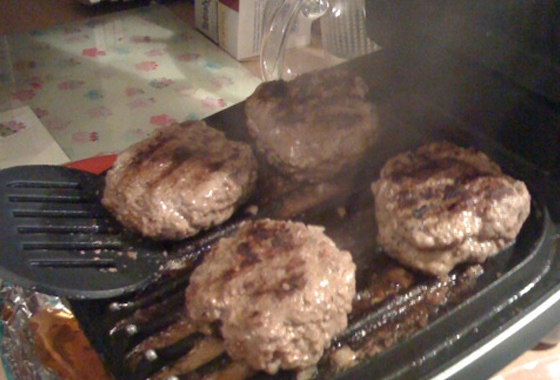 Personally I use my George Foreman grill – if you do the same lightly coat the burgers in olive oil or they will stick! Once complete, serve in a nice chunky bun with lots of salad and maybe some chips if you fancy a treat! Want to help Japan? buy Quakebook! hmm… might have to try your burger recipe out some time. I love to grill! I used to really dig Freshness Burger, but the last two times I’ve been there I was really disappointed. I’ll give ’em one more shot. I wish I had my George Foreman here in Japan! I had the grill and the roaster! It’s the only way to cook 🙂 Be sure to let me know if you give it a try! Aw that’s a shame, what was disappointing? quality of burger of the service? Freshness is also a hot place for hipster job seekers because they don’t have uniforms and allow employees to choose the lobby cds. It’s criminal that burgers so good are served with such lousy french fries, which, coupled with the prices, keep me from going there anymore. Interesting to know! I could imagine it being a pretty nice laid back place to work. I have to admit I rarely take price into account when i’m in Japan, I go into holiday mode and stop worrying about costs, that and the bungee-jumping exchange rate make it a nightmare to work out prices year on year! maaaaaate, 2 for the price of 1 post. a review and a recipe! gonna have to give the recipe a go – sorry, let me rephrase – gonna have to get the missus to give the recipe a go. 🙂 cool post! I aim to please 🙂 hope you enjoy them, let me know what you think!